The tool bag has 3 Levels of light output allow adjustment for wide area illumination or close-up work with a light output of 39 Lumens max. There are 28 Multi-use pockets inside and 13 outside to help you better organize your tools and the vertical pockets keep tools in sight for quick access. 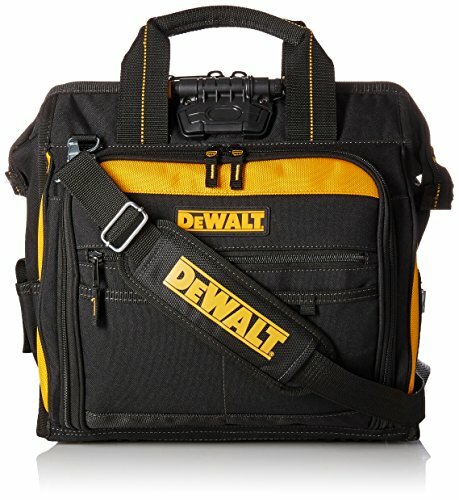 The tool bag has padded web carrying handles and adjustable shoulder straps for comfortable and convenient no-hands transport and a base pad feet to help reduce wear and abrasion. The tool bag holds a multitude of tools and accessories like drills, extension cords, pliers, screwdrivers, wrench sets, drill bits, testers and much more. LIGHTED TOOL BACKPACK: LED light can be easily directed at work area or into backpack to help identify tools and parts. 3 Levels of light output allow adjustment for wide area illumination or close-up work, light output 39 Lumens max. COMFORTABLE TO CARRY: Padded web carrying handles and adjustable shoulder straps and large pads on back for extra comfort. DURABLE: Base pad feet to help reduce wear and abrasion. 41 POCKETS: 28 Multi-use pockets inside and 13 outside to help you better organize your tools. HOLDS A MULTITUDE OF TOOLS AND ACCESSORIES: Like drills, extensions cords, pliers, screwdrivers, wrench sets, drill bits, testers and much more. QUICK ACCESS: Vertical pockets keep tools in sight for quick access.